On this weeks Two-Stroke Tuesday brought to you by Boyesen we look back at our completed budget Honda CR125 build with big smiles. 2-Stroke Hardware is full of items that are great for anyone restoring an older premix machine. 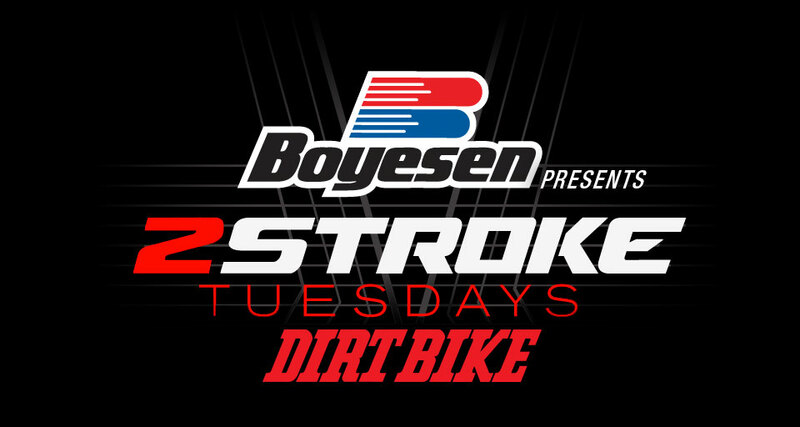 2-Stroke Theater features a few project bikes and a head to head battle with two brand new fuel injected KTM’s. Don’t miss the exclusive links to see KTM and Husqvarna’s 2018 two-stroke models . With this CR125 build we gave ourselves a $3,000 budget and that included the price of the bike. The bike cost was $250 and was delivered to us in about 10 different boxes. It’s pretty amazing what can be accomplished with some elbow grease and some imagination . One thing that had to be replaced was the OEM Mikuni carburetor . We broke the stock unit dialing in the jetting. Luckily Mikuni offers a replacement that comes jetted ready to go. It’s cost more than you would spend on Ebay but its guaranteed to work and the crew at Mikuni will be able to answer any questions you might have. The pipe was mangled and was fixed by Pacific Crest Pipe Repair at a fraction of what a new unit would of cost. We cleaned up and repacked the silencer packing making it good as new. Mylers supplied us with beefy replacement radiators. A lot of OEM parts were cleaned up and used . The engine was completely rebuilt by LA Sleeve and the cylinder was repaired as well. Rebuilding a complete 2-stroke engine is far more affordable than a 4-stroke thats for sure. Samco silicone radiator hoses added some bling and replaced the cracking stock units. MSR Hardparts makes a lot of bolt-on items for older 2-strokes that are affordable. The OEM wheel sets were cleaned up by Faster USA for around $200 and look amazing. YES, we did go over budget by about $600 and the bike is not perfect but it is very competitive at our local track and produces tons of smiles. We will take those results to the bank any day of the week! All our builds that you see have powder coating are done by Chris Johnson and the crew at San Diego Powder and Protective Coating. They understand what we need having a background on two and four wheels, have a fast turnaround and do some amazing work. Price : Contact for pricing. Dubya Cerakote wheel service. Are you on a budget but want your bike looking sweet? Dubya can give your OEM wheels a makeover with Cerakoting the hubs, new spokes and a Dubya rim. All for about half the cost of a brand new wheel set. When doing a restoration replacing bearings is a must ! Pivot Works makes replacement bearing kits for just about any machine out there and they wont deplete the old bank account. See the brand new 2018 Two-Stroke machines just announced from KTM and Husqvarna! CLICK THE IMAGES BELOW NOW. LAST DOG STANDING IS COMING!